Making Thanksgiving special is something that I love to do. I like to show my students that I'm thankful for them and make things fun and academic. 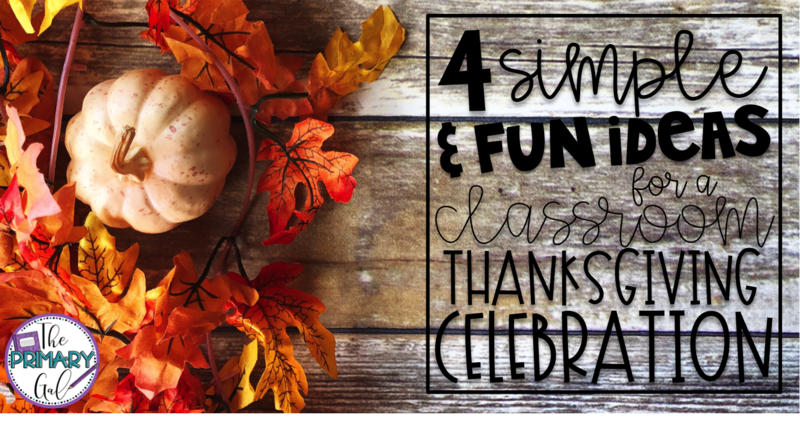 Here are a few things that I did with my kids to create a Thanksgiving celebration in my classroom. We started our Thanksgiving fun by making a little pumpkin pie. After all, no Thanksgiving is complete without a pumpkin pie, right? I found a simple recipe on Primary Chalkboard's blog and grabbed the ingredients. It was such a fun way to put some real-life math skills to work! I'll admit, we had been working on our Thanksgiving Meal Planner for a couple of days prior to this. Once we had our brains all warmed up and our bellies were full of pumpkin pie, we finished planning our Thanksgiving Day Meal. They worked to calculate the cost of each part of a Thanksgiving meal, such as main courses, side dishes, and desserts based on the number of people they were serving. I also had no intention of serving turkey, but I wanted to serve popcorn during our afternoon movie. So...I made turkeys out brown paper bags. I also bought pre-made popcorn from the chip aisle at Walmart. It was so much easier than popping multiple bags for my class of 36, and it tasted just as good! I have no idea what movie we are watching here, but they look into it! We watched a movie on Netflix during the afternoon. I *never* let them watch a movie, so this was a treat! During the movie, I served them juice and my homemade "turkey". It was a relaxing time to be together. They kicked back and ate popcorn and watched a movie!